A £3.5m public sector loan to a construction firm that went into administration was given to help it with cashflow problems, Wales' economy minister has said. The Welsh Government is owed £1.5m by Swansea's Dawnus from the 2018 commercial loan. Ken Skates said he is confident it will be paid back. The Welsh Conservatives' Russell George said the debt brought into question the Welsh Government's lending practices. Projects, including work on the £12m Kingsway redevelopment in Swansea and a road project in Manchester were halted when Dawnus went into administration last week. Swansea council said on Wednesday that it is hoping to complete a deal with Welsh civil engineering contractor Griffiths to allow work to restart. Dawnus employed 700 people across all its projects. Mr Skates told AMs that 455 Welsh suppliers were also affected, with the total value to the "Welsh supply chain" worth £6m. On Thursday it emerged the Welsh Government had given the company a £3.5m loan. A spokesman said the loan had been matched by £3.5m from the company's bank and helped "support the company, its employees and the supply chain working on Dawnus projects across Wales". "We've received £2m of the loan back already, and are confident that the terms of the loan will see outstanding moneys repaid in due course." Ken Skates told AMs the loan was offered "in order to help the business and its employees… during a very difficult period concerning their cash flow". Image caption Ken Skates said ministers' attention was on the firm's employees. The minister said he is confident the terms of the loans will see outstanding monies paid in due course. "It is right that at this moment in time the focus of our attention should be on the employees and subcontractors, who are undoubtedly being badly affected by the developments at Dawnus," he said. "We are focusing our attention on the fact that the impacts of the company's demise are minimised." Suzy Davies, Tory South Wales West AM, said she thought an "element of the confidence shown in this company by councils" would have been partly based on the green light the Welsh Government had given the firm. 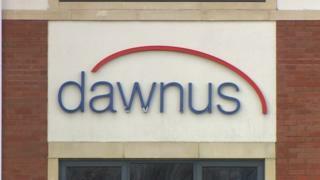 The Welsh Government said full due diligence had been carried out on the firm in conjunction with Dawnus' bank. Russell George, Tory economy spokesman said the debt "is brings into question the Welsh Government's approach to business lending practices". "It was deeply concerning to hear last week of so many Welsh jobs and infrastructure projects threatened by the collapse of Dawnus, and this latest development further compounds the bad news," he said. "We make no apologies for investing in the Welsh workforce," the Welsh Government said. Three school building projects in Powys were reportedly facing delays following the collapse of the company. Administrators from accountants Grant Thornton, who have taken over construction company Dawnus, have made contact with Powys County Council (PCC).